Alumicolor® offers Compass Rulers in 12" and 18" sizes. 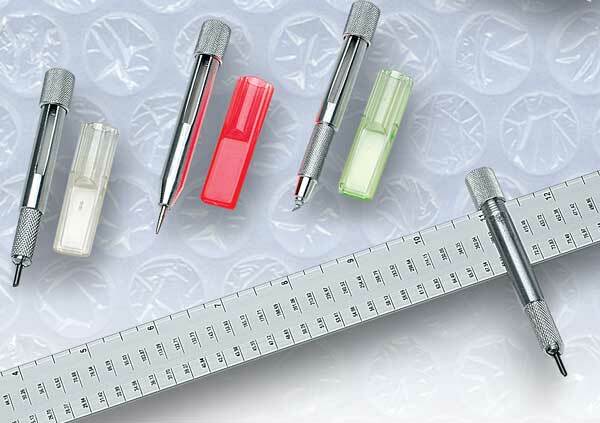 Compass Ruler sets include the shaft, anchor point, lead holder and lead all in one package. Make circles up to 24" with the 12" set or 36" with the 18" set. Automatically gives radius, area and circumference. Adjust circle size with fingertip control. Calibrations in inches on one side and metric on the other. As an alternative to the Compass Rule, Alumicolor® also offers Compass Point Sets for use with your existing ruler or yardstick. Compass Point Sets include the anchor point, lead holder and lead for drawing circles, and a rotary knife for cutting circles. Compass Point Sets also fit Alumicolor® rulers and yardsticks. 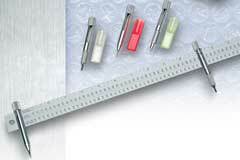 The straight edge size fits 6" to 24" rulers, code 1589 through 1594. The yard stick size fits 30" to 48" rulers, codes 1595 through 1598. Packaging: Compass Rule: Poly-sleeve bag with hang tag. Compass Point Kit: Blister pack.